Happy Father's Day to Michael, who makes it look so easy to be a great Dad! How blessed we are that you belong to us! 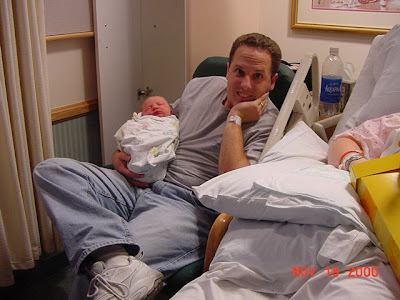 Michael on the day he became a Daddy, holding brand new baby Nathan and already looking like a pro! 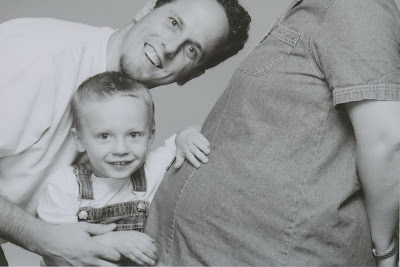 Father's Day, 2003, right before Michael became a Daddy to two boys! I love this photo! I emailed it out to everyone with the subject "Michael and his two boys" and everyone thought Ben had been delivered early! No, we just had a creative photographer for this Father's Day Portrait! 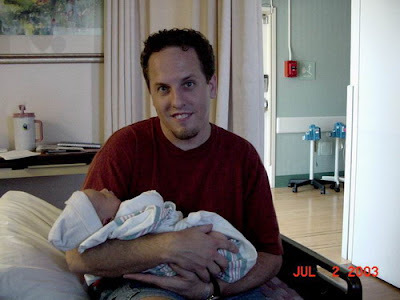 Michael, holding Benjamin two days before Ben's heart surgery. 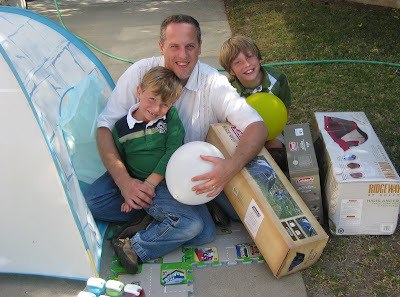 For his big Father's Day gift, the boys got Michael a new tent and air mattress, which we cleverly "wrapped" by putting it in one of the boys play tents from Ikea. Yes, there are two tents in the photo below, I returned the smaller one since I didn't know which size he'd prefer... I'm not a camper myself! This is for Daddy and his boys!